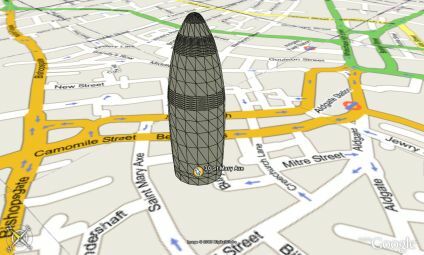 A rapid model of 30 St Mary Axe in London with Google Maps overlayed in Google Earth. The air photography of London is low resolution at the current moment, thus the need to overlay the streets with imagery from Google Maps. The map placement is approx 5 metres out but it illustrates a good proof of concept. Google Earth is also rendering the edge profile the building, this should be sorted in a few days.